Spending time the day after your destination wedding to casually stroll around the place you chose to marry can be a wonderful way to wind down your celebrations and prepare yourselves for your honeymoon travel. This couple chose to wear more casual clothing, while other Day After Sessions involve the full wedding dress and suit from the wedding day. Regardless of your preference, we love these glowing, happy moments when you can't stop looking at each other! This session was in Naples, Florida, just a few minutes from where their ceremony was the day before. The weather in Florida can be fickle; often in our winter the weather is lovely, warm, and welcoming. This particular wedding weekend was lovely, but much chillier than any of us were expecting! Working around expectations with weather, whether that’s dealing with rain squalls, sudden chilly temps, or blazing heat, is one of the challenges we’ve tackled as our photography business has grown and expanded. We pride ourselves on being prepared for any contingency, and this wedding taught us to always have a throw blanket in the car in case of a chilly client! The Naples are on the west coast of South Florida is charming; a slower pace than the Palm Beach area, the people are relaxing, the food is delicious, and it feels like a perpetual relaxing stage of vacation. 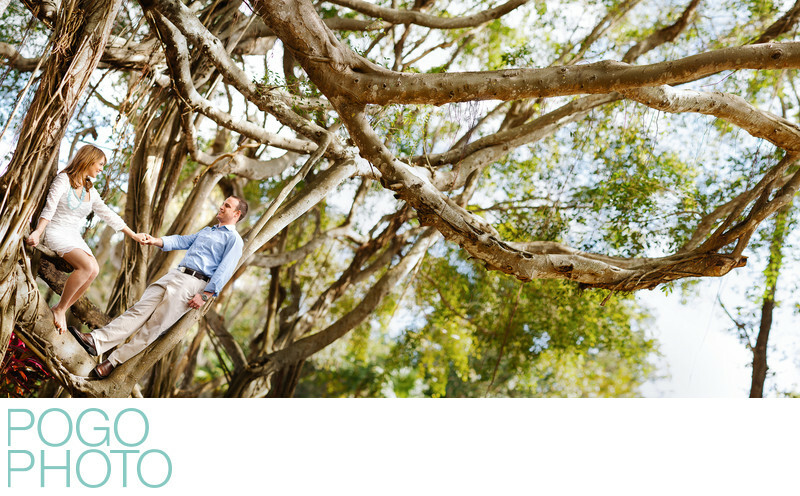 This image was shot in a nearby garden, and shooting from a low angle gives the impression that the couple is in a much higher part of the tree than they actually are; in reality they are only about four feet off the ground, as safety of our clients is a very important priority to us. Photographing this image as a bokehrama (multi image panorama shot at a wide aperture to create an almost three dimensional look to the resulting scene) enabled us to showcase the sweeping boughs of this enormous Floridian tree. 1/1000; f/2.0; ISO 200; 85.0 mm.